This week's doorway is a little unusual, the doorway I mean. It is of the Stata Center in Cambridge. You can see the whole building by clicking here. The building is a Frank Gehry designed/inspired building. You can see another Frank Gehry building like this at Prague Daily Photo. I've always admired F Gehry. Your photograph is great! That is fantastic, really love it. Just took a look at the whole building as well. What a great place for some mono shots as well. Also, I would love to take some 15m or 25mm wide-angle shots up close, the perspective would be great. Lot of opportunities with that one. It's a real modern architecture and very impressive! 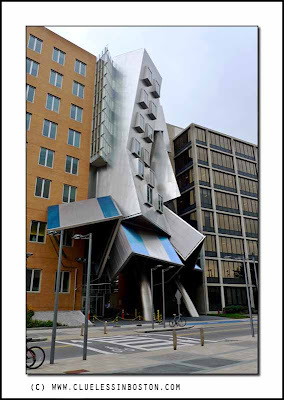 What a mess of a building, but I really like this exhibitionist architecture in which Gehry thrives. The doorway is obviously impressive! I'm not a big Gehry fan. To me this building looks like the aftermath of a tragic accident. On a side, I find it funny, and on the other, I find it disturbing!I think I prefer classical architecture, even if I can understand that this kind attracts the eyes and makes very interesting shots! I featured one of his buildings a while back. Love him or hate him, but you can't ignore him. It is unusual! I can't decide whether I like it or not. Interesting yes - reminds me of something a child might create when he's playing with his inner architect. Looks like it's falling down. I might run in through the door quickly in case it all collapsed on me! I had no idea there was anything like Prague's Gehry. Stupid me, I should have known better. This is great, a fantastic doorway! I am a fan of Gehry. We have one in NY too. Wow, I love this building! Genius. Good photo! A "little" unusual? It looks the place is collapsing into itself. Funky foto of a funky place! I wonder what the inside of the building looks like. Frank Gehry is good. And so are you. I want one like that ! Crazy! And I love it! I've been meaning to get over to MIT and see this in person for a while now, and your photo makes me want to do it.